Koules Fortress, the foremost landmark of Heraklion. The capital of Crete is a lively university town with outstanding historical landmarks and an engaging and energetic atmosphere. It’s a gateway, a capital and Crete’s university town, with all the advantages and a few of the drawbacks of a city proper. It’s vibrant, outgoing, accessible and culturally rich; it’s also not a “classical beauty.” Nonetheless, Heraklion (aka Irakleio) has built up a good reputation over the past decade and, as of last year, it was Europe’s fastest-growing tourism destination. The city has made well-targeted efforts to improve its image with a series of initiatives that includes facelifts to key monuments, the coastal front and the historic center, and a complete revamp of its Archaeological Museum. It has also invested in technological innovations geared towards enriching the visitor experience, such as interactive screens at museums and the municipal Info Point, all developed by the University of Crete and the Foundation of Research & Technology – Hellas (FORTH), one of Europe’s leading research centers. 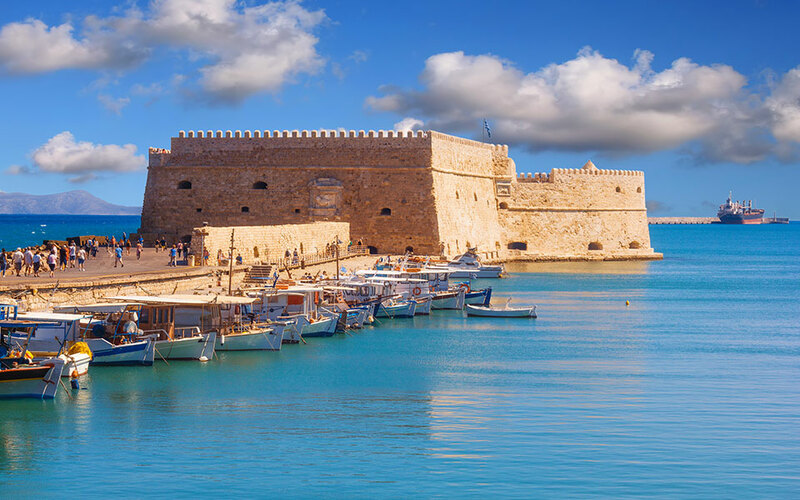 The city’s harbor once served as a port for Knossos, the Bronze Age capital of the Minoan civilization, and later, in ancient times, for a city called Heraklion. The port was fortified in the Middle Ages, when the city came under the control of Saracen pirates who chose it as their base in Crete, calling it Chandakas. Next came the Byzantines and then the Venetians, who maintained the city’s identity as a capital, renamed it Candia and endowed it with some beautiful buildings and fortifications that are still visible. Under the Ottomans, it was known as Megalo Kastro (“Big Castle”), only to become Heraklion again once the free Cretan State was established in 1898. The entire island became a part of the Greek state in 1913. Today, with a population of 174,000 residents and some 15,000 students, Heraklion is a proud and vibrant city; you feel its energy from the moment you first step foot in it. Crowds, cars, shops, open-air markets, street sellers and tourists from all over help provide this city with its characteristic lively temperament. The first thing you’ll see, no matter how you arrive, will probably be the Venetian Harbor, where today small fishing boats dock, across from the old dry docks. But what will really catch your eye here is Koules (Open 8:00-20:00), the small castle out on the pier, built by the Venetians in the 16th century, which recently underwent restoration. The 2.5km concrete jetty that starts at Koules is a popular afternoon promenade. The Venetian Loggia, in the very center of the city. From the port, the human river will carry you up 25 Avgoustou Street – past neoclassical buildings and souvenir shops selling bronze Minotaur statues, cheap Phaistos Disc replicas and T-shirts printed with “Cretan” motifs – to the city’s historic center. Once you’re in the Old Town, you’ll spot the Church of Aghios Titos, built in 961 by the Byzantine Emperor Nikephoros II Phokas and renowned for its stained-glass windows. It served as the island’s metropolitan see before being transformed into a mosque during Ottoman rule. 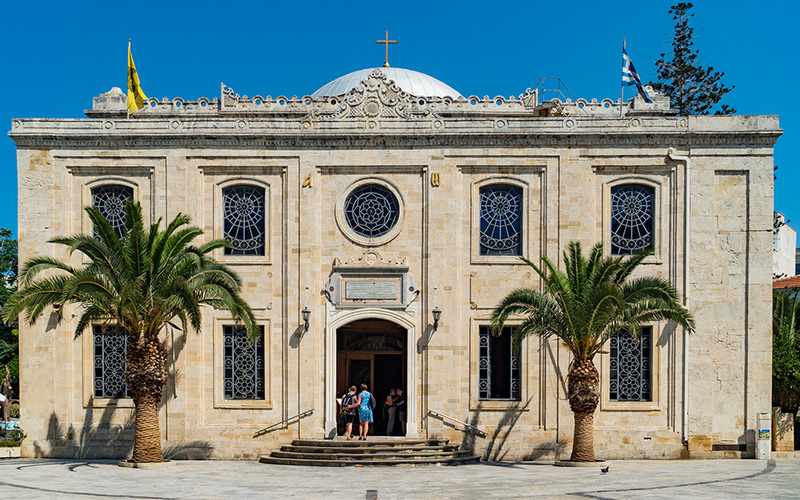 There’s also the Loggia, arguably the most beautiful building in Heraklion, built as a private club for Venetian nobles, and today the City Hall. The Venetian Church of Aghios Markos, which dates from the 13th century, currently plays host to all sorts of cultural events. 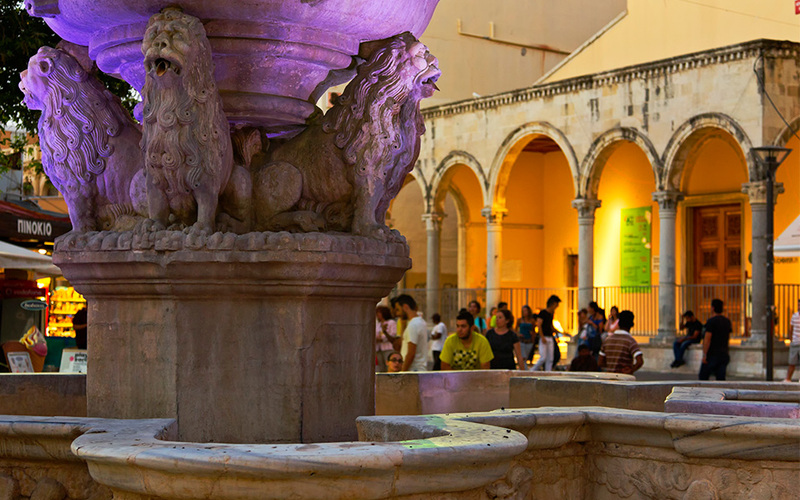 The fountain on Eleftheriou Venizelou Square, affectionately called “The Lions,” is the city’s most popular meeting spot. 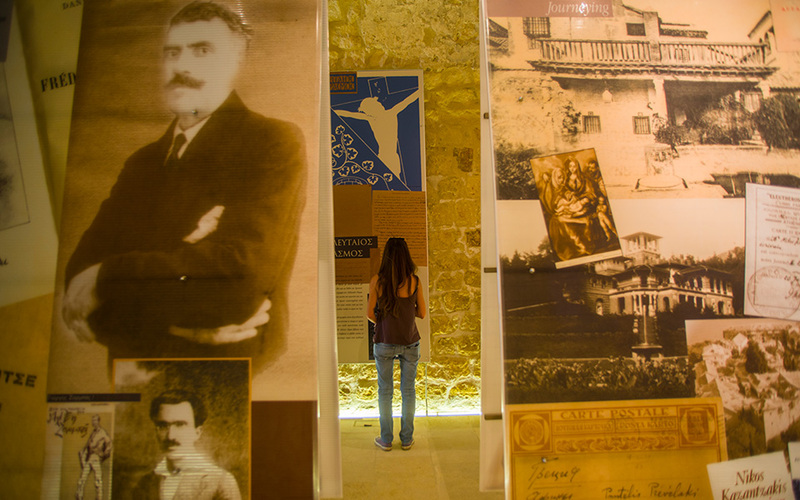 Τhe restored Gate of Jesus hosts a permanent display on the life and works of author Nikos Kazantzakis, Heraklion's most prominent son. All of these monuments are a stone’s throw from Lions’ Square (officially called Eleftheriou Venizelou), with its famed fountain, part of an aqueduct built by the Venetian Doge Francesco Morosini. 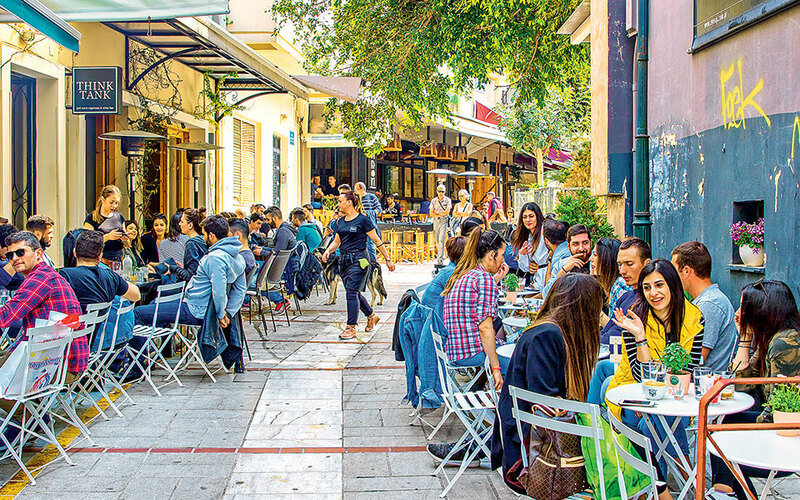 The square, which is flanked by cafés and restaurants, is a good example of one of the things that makes Herklion special: the way in which its historic monuments are incorporated into modern life. This is also the case with the fortifications outside the historic center where you can walk atop the old city walls (they run for 7km, but the footpaths only cover 4km). The entrance gates can be reached from Plastira Street: at Saint George’s Gate on Eleftherias Square, you may come across an art exhibition or a bazaar by local artists, while Jesus’ Gate hosts a permanent exhibition on the life and work of writer Nikos Kazantzakis (Open 09:00-17:00). The two open-air theaters beside the walls host concerts and plays over the summer. 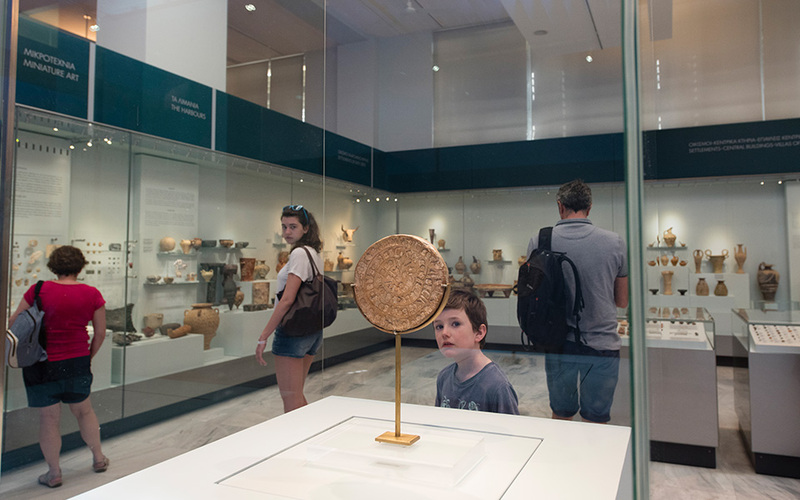 The Phaistos Disc, one of the most important exhibits in the Irakleio Archaeological Museum. Heraklion has many museums worth visiting, foremost of which is the Archaeological Museum (2 Xanthoudidou, Eleftheria Square; Open 08:00-20:00). Housing such wonders as the Phaistos Disc and the Knossos Palace frescoes “The Prince of the Lilies” and “La Parisienne,” it is one of the most important museums of its kind in the world. The Museum of Christian Art (Aghia Ekaterini Square; Open Mon-Sat 09:30-19:30, Sun 10:30-19:30) is in the 13th-century Monastery of Saint Catherine of Sinai and displays priceless heirlooms and icons. The Museum of Natural History (Sofokli Venizelou, Dermata Bay; Open Mon-Fri 9:00-21:00, Sat-Sun 10:00-21:00) uses technology to great effect and offers a very special interactive experience for children. The cafés of the historic center are full of life, day and night. Wherever you are in the city, around 2pm do as the locals do and head to the closest kafeneio for raki and meze; the best are Kagiabis (12 Monofatsiou) and Sarantavga (1866 Street). For sweets and desserts, look for Aretousa (19 Kosmon) or for Queen Boutique Desserts (Agiou Titou & 13 Evropis). For breakfast, try the famous bougatsa custard pie at Kirkor (32 Venizelou/Lions’ Square). You can pick up great local products and deli foods at Alati tis Gis (4 Giannitson), Cretan music CDs at Aerakis (14 Korai Sq.) and souvenirs at Zalo (2 Papa Alexandrou), where they also sell the locally made Nivo natural soaps and an excellent cultural city map published by Staridas Geography. 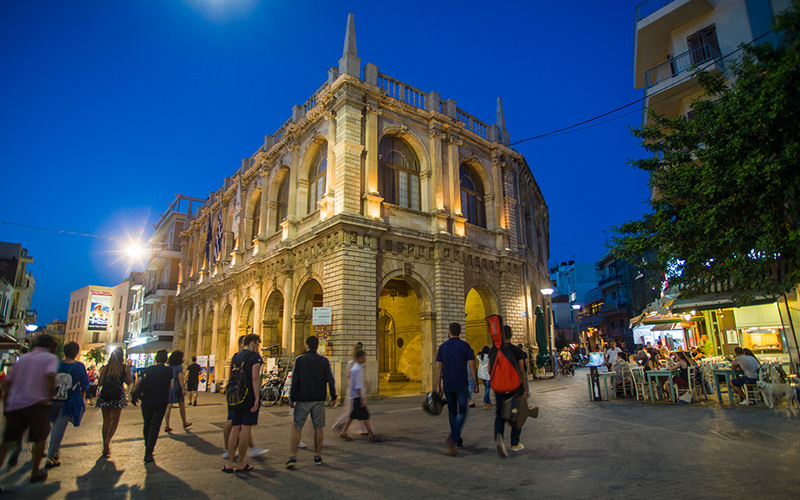 Come nightfall, stroll around the historic center: Korai, Dedalou, Perdikari, Androgeo and all the pedestrian streets east of Lions’ Square are packed with small bars and raki joints. For cocktails, head to Parko 240 (Milatou & Ideou Androu) and Halavro (10 Milatou). The steps of the Loggia are a popular hangout for people watching and socializing. Look around, and you’ll notice plenty of smiles. In Heraklion, it’s always about having a good time.